In September 2011, Emanuel Mori, the president of the tiny Pacific Nation Federated States of Micronesia made a desperate plea to the UN General Assembly. “More than 60 years ago, my island country drew worldwide attention as a battleground in the Pacific conflict. Today, the remnants of an estimated 60 shipwrecks from that conflict are posing threats to the lives of our people, our environment and the marine ecosystem,” he said. 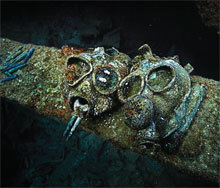 The underwater ghost fleet Mori spoke about lies below the placid surface of the 60 km-wide Chuuk Lagoon in the Pacific Ocean. During World War II, the lagoon was Japan’s main base in South Pacific. It provided Japan with a perfect natural harbour to protect its large ships. The Japanese moved their military across and fortified the islands. They built an airstrip at the lagoon and made it such a successful base that it soon caught the eye of the Allied forces as the Gibraltar of the Pacific. The US forces feared Japan would use its base in Chuuk to check their advance on the Japanese mainland. In February 1944, as the US fought its way across Micronesia, it launched a strike against Japanese naval forces in the lagoon. The American armada included five fleet carriers, four light carriers, seven battleships, submarines, destroyers and over 500 aircraft. Called Operation Hailstone, the US attack sank a good part of Japan naval forces in Micronesia. More than 60 destroyers, cruisers, merchant ships, oil tankers and support vessels were left at the bottom of Chuuk Lagoon. Very few of the troops aboard the sunken ships survived. The attacks ended Chuuk Lagoon as a major threat to Allied operations in South Pacific. 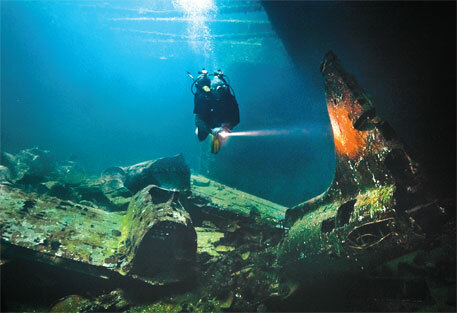 Today, the shipwrecks are a major tourist attraction and Chuuk Lagoon is a paradise for divers. But these coral- encrusted vessels, legacy of the first war based on petroleum, also contain noxious cargo, thousands of barrels of oil and other fuels, and sometimes unexploded ordnance, claim environmentalists. In 2003, when US conservationist Michael Barrett began examining this issue, no one had ever mapped the wrecks precisely or done a comprehensive survey of their fuel holdings or the ecosystems they might threaten. In a study that spanned three years Barrett noted that the ghost ships have hazardous potents. The conservationist was able to trace an oil slick in the lagoon to a large Japanese tanker, HoyoMaru, which was sunk during the 1944 attack and now rests upside down on the sea floor. But for decades, scientists and governments have said it is best to leave these shipwrecks alone. Most of the ships also double as underwater military graves, sacred sites that no one wants to violate. Japan, US and the UK have repeatedly asserted control over the remains of their World War II ships. All three countries say the wrecks are maritime graves and cannot be salvaged by anyone else without permission. Scientists say cleanup is laborious, expensive, and can cause problems if handled incorrectly, releasing oil or other pollutants into ocean waters. Conservationists like him point to the risks posed by the U S SMississinewa, a tanker sunk in 1944 by a Japanese suicide submarine near the Micronesian island of Yap. In 2001, the Mississinewa was jostled by a typhoon and began releasing more than 300 gallons of fuel a day on and off for a year-and-a-half. Micronesia declared a state of emergency and temporarily banned fishing, which island residents depend on for income and subsistence. Nearly two years after the typhoon, US Navy organised a comprehensive cleanup. Divers used a technique called hot tapping—in which submersible hoses are attached to oil or fuel tanks and the liquid is pumped to a barge on the water’s surface—to offload most of the ship’s remaining oil. Nearly two million gallons of oil were recovered. Some was re-refined and sold, recouping a portion of the US $5.5 million cleanup cost. 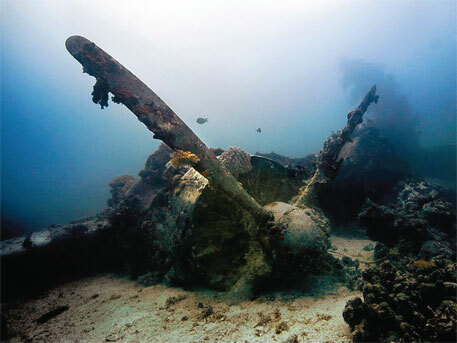 Micronesia is not the only Pacific nation to face pollution problems because of World War II shipwrecks. During the war, American, Japanese, British, Australian and New Zealand’s naval ships were sunk in more shallow waters in the north Pacific. Many vessels were also wrecked in waters off Papua New Guinea and Kiribati as the Allied and Japanese forces fought for control of the islands. And so many Allied and Japanese ships sank in a strait near the Solomon Islands during Battle of Guadalcanal in 1942-1943 that it became known as Iron Bottom Sound. “World War II was the single, largest loss of shipping in a relatively short period of time the world has ever witnessed,” Gilbert says. In a 2005 paper she argued that “more than 7,500 sunken World War II vessels, including over 860 oil tankers, corroding for over 60 years at the bottom of the world’s oceans are a severe environmental challenge”. “Word War II was the first war where ships carrying petroleum were the first targets for attack by the enemy, and because it was a global war, these ships are spread all over the place,” says historian David Conlin. The amount of oil contained in these ships could be anywhere from 757 million gallons to 6 billion gallons, he says. That amount is between three-and-a-half and 30 times the estimate for the amount of oil spilled by the Deepwater Horizon disaster in 2010. The spill from the British Petroleum-operated project in the Gulf of Mexico amounted to 205.8 million gallons. However, the submerged ship’s threat is different from that of the recent oil spills, since the World War II vessels are scattered and would not come apart all at once.